Fungi play an important role in cycling organic matter and nutrients in marine ecosystems. However, the distribution of fungal communities in the ocean, especially the vertical distribution along depth in the water column, remained poorly understood. Here, we assess the depth-related distribution pattern of fungal communities along the water column from epi- to abyssopelagic zones of the Western Pacific Ocean using internal transcribed spacer 2 (ITS2) metabarcoding. 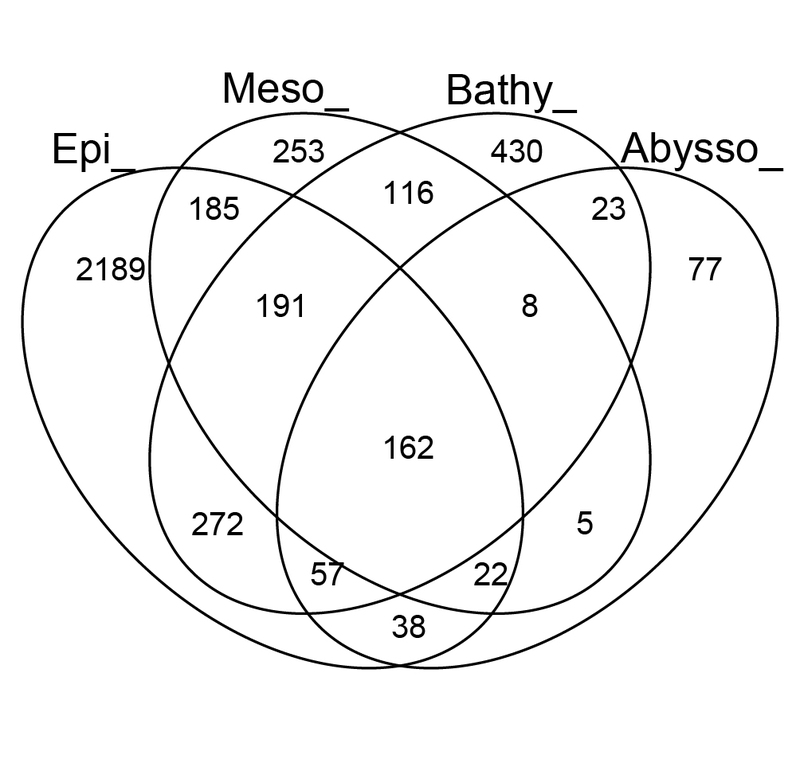 Majority of the assigned OTUs were affiliated to Ascomycota, followed by three other minor phyla (Basidiomycota, Chytridiomycota, and Mucoromycota). The epipelagic zone harbored a higher OTU richness with distinct fungal communities as compared with meso-, bathy-, and abyssopelagic zones. Across the whole water column, depth appears as a key parameter for both fungal α- and β-diversity. However, when the dataset was split into the upper (5–500 m) and deeper (below 500 m) layers, no significant correlation was observed between depth and community compositions. 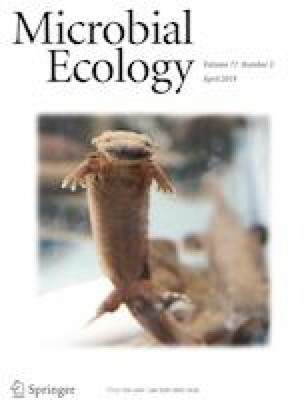 In the upper layer, temperature and dissolved oxygen were recognized as the primary environmental factors shaping fungal α- and β- diversity. By parsing fungal OTUs into ecological categories, multi-trophic mode of nutrition was found to be more prevalent with increasing depth, suggesting a potential adaptation to the extreme conditions of the deep sea. 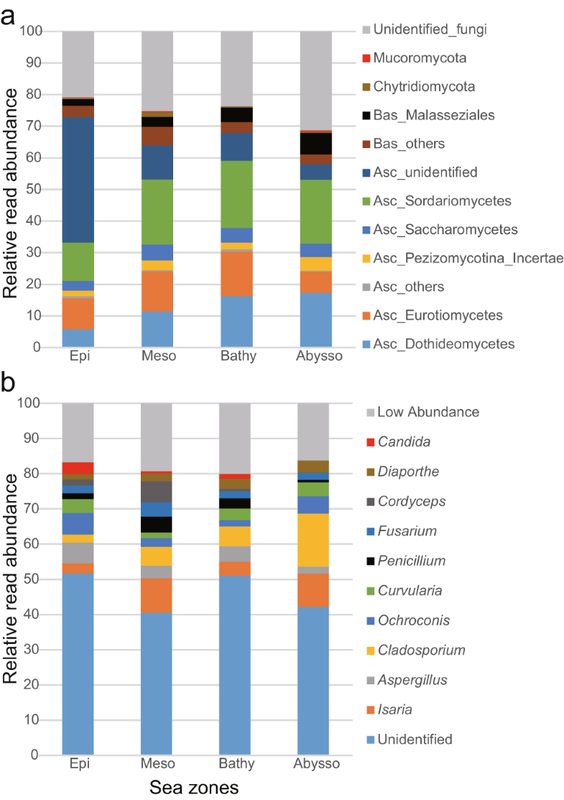 This study provides new and meaningful information on the depth-stratified fungal diversity, community structure, and putative ecological roles in the open sea. Mengmeng Wang and Gaëtan Burgaud contributed equally to this work. The online version of this article ( https://doi.org/10.1007/s00248-019-01374-y) contains supplementary material, which is available to authorized users. The authors would like to thank the anonymous reviewers for their helpful and professional comments. The authors also thank crews of Kexuehao research vessel for their help in collecting samples. This study was supported by the National Key Research and Development Program of China (Project No. 2016YFC1401800) and National Natural Science Foundation of China (Project Nos. 31670012, 31872615). MM Wang acknowledges CAS 153211KYSB20160029 for supporting her postgraduate studentship.